The application of nonwoven fibrous matrices made of biodegradable polymers for medicine and tissue engineering is a promising direction in bioengineering. The matrices based on poly-3-oxybutyrate biopolymer with the use of titanium dioxide and silicon nanoparticles have been produced via electrospinning. It is found that nanoscale particles accelerate crystallization and melting of polymer and improve the physicomechanical parameters of the fibrous materials. It has been shown that the most favorable foundation for growth of the living cells is matrices made of filaments of small diameter. 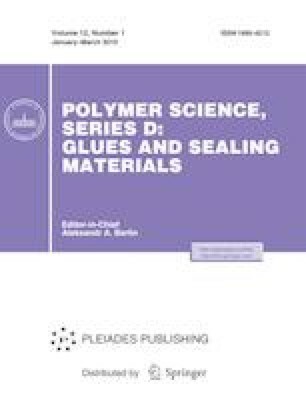 Nonwoven fibrous matrices of poly-3-oxybutyrate can be proposed for tissue engineering and traumatology. This work was partially supported by the Plekhanov Russian University of Economics (A.A. Ol’khov) and Russian Foundation for Basic Research (project no. 15-29-04862-ofi_m) (V.N. Gorshenev) and within the frameworks of a state order for the Institute of Chemical Physics, Russian Academy of Sciences (0082-2014—0009, state registration no. AAAA-A17-117040610309-0) (A.L. Iordanskii), and a state order for the Institute of Chemical Physics, Russian Academy of Sciences (0082-2018-0006, state registration no. AAAA-A18-118020890097-1 (O.V. Staroverova). The measurements were carried out with the use of the New Materials and Technologies Center of Collective Use of the Institute of Biochemical Physics, Russian Academy of Sciences .